Karen Pretorius, our baker, spent the month of August in Italy making cheese in a little village called Roncà in the Province of Verona, located about 80 kilometres west of Venice. 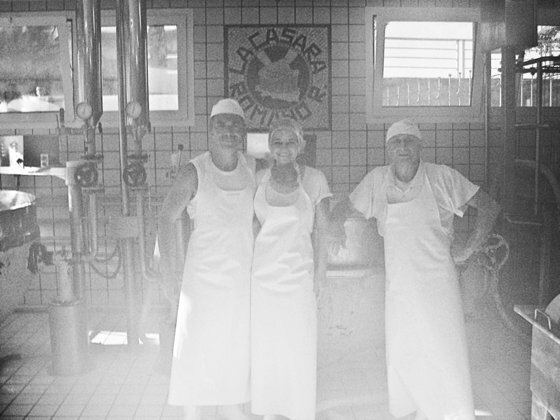 La Casara is a family-run cheese factory dating back to the 1920’s when Ermenegildo Roncolato and his children, Romano and Angelo, began making cheese. Today it is Romano’s children, Giovanni, Gildo and Letizia who are keeping the tradition alive. 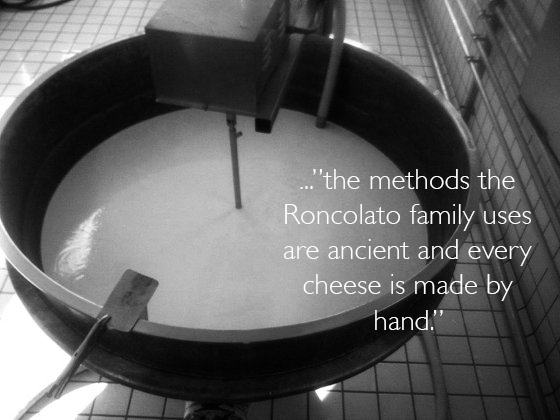 Even though they make over 50 different kinds of cow, goat and sheep’s milk cheese and process over 15 000 litres of milk daily, the methods the Roncolato family uses are ancient and every cheese is made by hand. 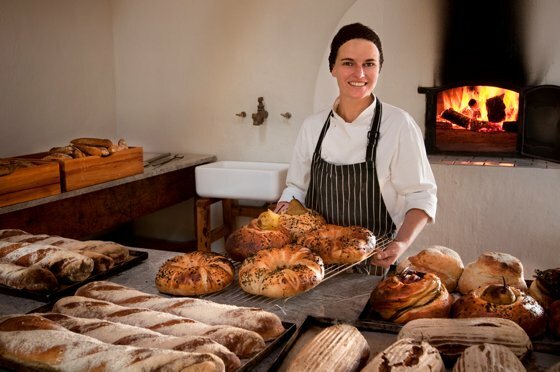 A day at La Casara starts at 5am, the same as the bakery at Babylonstoren, with tankers bringing the milk down from the mountains, where the Bruna Alpina cows graze on fragrant herbs. Before work can commence, cheesemakers have to dress appropriately: white wellies, plastic aprons and hats. They even have to shave their arms, and Karen had to follow suit. The milk is pasteurised and pumped into massive copper cauldrons. Just like baking bread they start the magic with a mother culture that is added to the milk before gently heating it, and then adding the rennet. At the precise time of coagulation the milk is cut, big pieces for making young cheeses, and very small pieces for making older cheese. The curds are then gently pressed together, cut again, and weighed into molds. 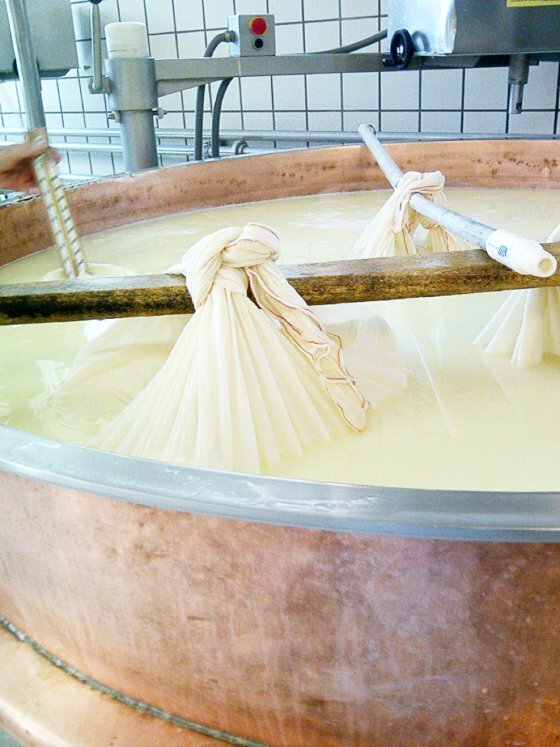 The cheeses are left to steam in the very humid cheesery, which is kept at a temperature of 35°C. Working in the cheesery is a bit like working in a sauna. After all the hard work everyone sits down to a hearty breakfast of bread, charcuterie, cheese and wine (yes really), before the whole ritual is repeated. Every cheese is turned at least four times, and when it has reached the correct pH they are submerged in giant salt baths overnight. 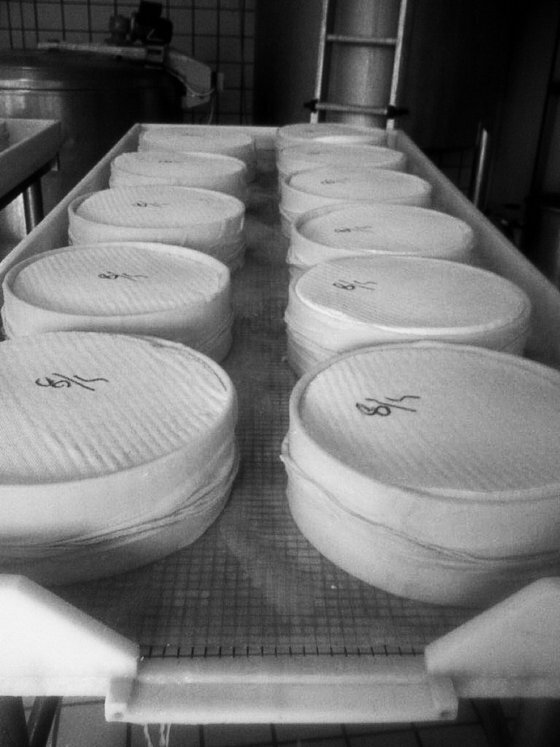 In the morning they are taken out, left to dry, and then taken to a giant underground cellar to mature. Although all La Casara’s cheeses are excellent, they are especially well known for their Monte Veronese cheese. Monte Veronese is an Italian cheese made from cow’s milk which is produced in the northern part of the Province of Verona, more specifically in the Lessini mountains or the Veronese prealps. Historical references indicate that production of this cheese began in the 1200’s with the arrival of the Cimbrians, a German population that came to Italy in search of fertile plains for their livestock. They found the perfect place in the Lessinia Mountains, which at that time was a large uninhabited area that local shepherds used for the grazing of their herds of goats and sheep. Thanks to a bishop’s concession, this population was given permission to use all the resources that this land offered until 1689. Today Monte Veronese has DOP (Denominación de Origen ) status, a regulatory classification, that protects the recipe for generations to come. So why is Karen learning how to make cheese? The clue might be in the Babylonstoren garden… we have a herb called lady’s bedstraw growing in the garden that it has been used as a rennet for centuries-watch this space. Thank you Laura. See you soon!